Telecommunication giant, Vodafone Ghana, has donated several pints of blood to the National Blood Service (NBS) through a recent blood donation exercise at its headquarters within the Airport City enclave to support victims of the recent flood and fire disasters. The exercise which was aimed at increasing the country’s blood stock levels in handling flood-related emergency cases brought together staff from UT Bank, Stanbic Bank, Price Waterhouse Coopers (PWC) and other organisations around the Airport City enclave to support the exercise. 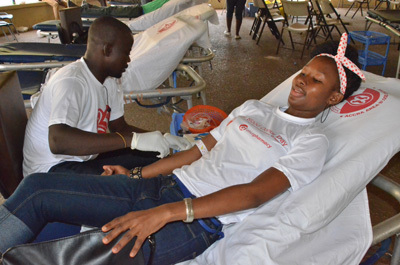 According to Ebenezer Amankwah, Corporate Communications Manager at Vodafone Ghana, the blood donation exercise was part of Vodafone Foundation’s core mandate to support the communities in which they operate in. “The mayhem and disaster that befell the country of June 3 has moved us to support people in need and the blood bank is always one of the institutions that need help with blood to support people in need of blood because of the situation. We look forward to collecting a lot of pints of blood from this exercise for the blood bank. If we do this, the blood bank can get a breather for the next months to come in terms of responding to emergencies like this,” Mr Amankwah said. He added that that his outfit would embark on the blood donation exercise frequently in a bid to ensure that National Blood Service would have stock to handle such emergencies in future. “We realised that the unavailability of blood meant that more lives could be lost. As a caring brand, Vodafone Ghana was touched by the plight of the flood and fire victims, we believe we have a role to play in saving the lives of victims of the floods and the associated emergency cases,” he said. Sophia Lissah, External Affairs Manager at UT Holding, said her outfit also joined the blood donation exercise because they saw it as another opportunity to contribute their quota to save more lives from flood and fire disaster.